The Department of Teaching and Learning promotes academic excellence, enhances educational opportunities for District 97 students and staff and strives to improve the quality of teaching and learning by providing leadership and support. In D97, we work to foster a growth mindset in all stakeholders across the organization. This means that as an organization, we embrace challenges, we persist in the face of setbacks, and we apply effective effort to improve our knowledge and skills. Moreover, when we make mistakes or fail, we embrace our failures as opportunities to learn. For more information on the research behind growth mindset and its power to improve learning, please see “The Secret to Raising Smart Kids” and “Carol Dweck Revisits the Growth Mindset,” both by Carol Dweck. No aspect of teaching and learning lives in isolation. Standards, skills, curriculum, instruction, assessment, and data analysis are all part of an ongoing, iterative cycle. Teaching and learning begins with planning from standards and skills, which leads to a strong, aligned curriculum. Best-practice instruction follows. Learning is then assessed and analyzed, leading to a deeper understanding of where students stand in relation to needed standards and skills. 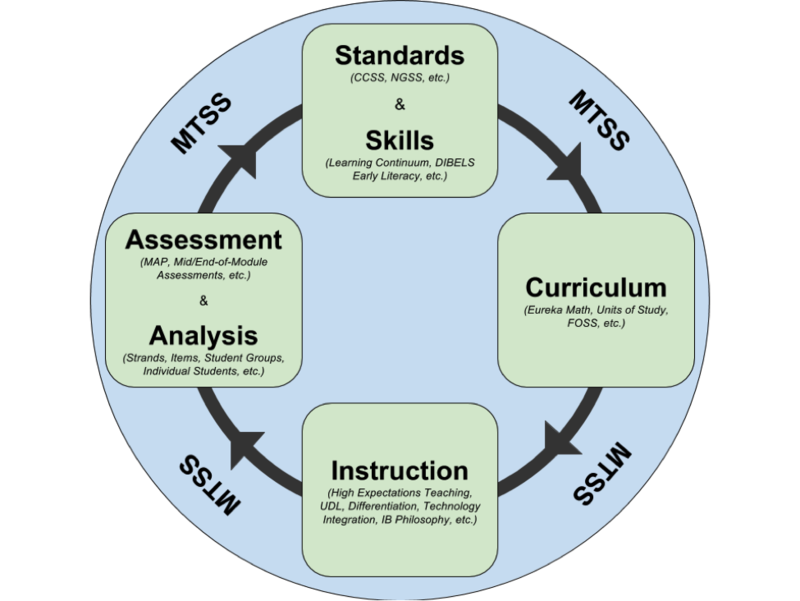 All components of the teaching and learning cycle should be surrounded by multi-tiered systems of support (MTSS) for students. Components of this cycle can connect to each other in numerous ways. For instance, assessment infiltrates the cycle at multiple points. Assessment typically occurs during and after instruction. However, assessment design typically occurs in between standards and curriculum. In addition, assessment clarifies the meaning of the standards, aligns the instruction to the curriculum, and aligns curriculum and instruction to the final benchmark we need students to cross.